There were going to be about 30 people there, so I knew a 3-tiered cake would be WAY too much. I drew up a few different designs, but finally settled on one that I thought would make her happy. So, I, of course, kept with the zebra theme when decorating the cake. Jennifer said she wanted vanilla cake with vanilla buttercream, so that was the bottom tier. The top tier was lemon cake with a raspberry buttercream for the people who wanted something a little different. This was the cake without most of the little add-ons that I made - those were put on the cake when we got to the shower. 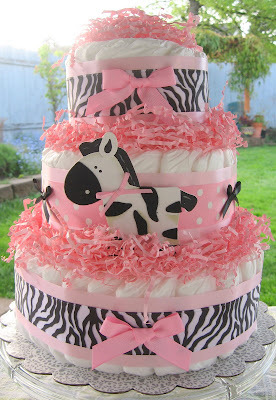 The zebra and all of the coverings were made from fondant, and the pink "grass" was colored coconut. When we got to the shower, they had a place all set up and ready for the cake. We could really see how the zebra stripes make good camouflage. I added all of the little accessories. I had made mini cupcakes and little baby-themed chocolates, along with all of my fondant accessories. The ring that the cake was in was made from decorated chocolate bars. How cute was that? Overall, I think the glowing mama-to-be was pretty happy with it.